Arrival at Ben Gurion Airport, where you will be met by your Christian Holyland Tour representative and transferred to your hotel in Jerusalem. Today you’ll visit the tomb of King David and the room of the Last Supper on Mt. Zion. Upon entering the walled city, you’ll walk through the newly restored Jewish Quarter and visit the Roman Cardo, the Herodian Quarter and continue to the Western Wall. 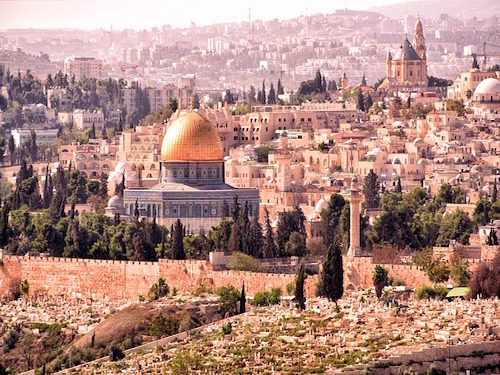 Your walk continues along the Via Dolorosa to the church of the Holy Sepulchre, after which you’ll proceed to Mount Scopus and then to the Mount of Olives for a magnificent panoramic view of the Old City. Next you’ll continue to Bethlehem*, stopping at Rachel’s Tomb and a visit to the Church of the Nativity. The day ends back in your hotel in Jerusalem. First you’ll drive to the Hadassah Medical Center in Ein Kerem to see the Chagall stained glass windows and then to Bayit Vegan to visit the miniature model of Jerusalem as it was during the Second Temple period. Next you’ll continue to Yad Vashem, the memorial to the Holocaust and then to the Israel Museum. At the Museum, you’ll visit the Shrine of the Book where the Dead Sea Scrolls are housed and see the Knesset, Israel’s Parliament, and the Givat Ram Campus of the Hebrew University. Then it’s back to your hotel in Jerusalem. Today, your day begins with a drive through the Judean Desert to the Dead Sea, the lowest point on earth at almost 1300 feet (400 meters) below sea level. You’ll stop at Qumeran to visit the site where the Dead Sea Scrolls were found and then continue your drive along the shores of the Dead Sea to Massada. You’ll ascend the mountain by cable car for a tour of the ancient fortress where the Zealots made their last stand against the Romans before committing mass suicide in 73 AD. When finished, you’ll descend by cable car and time and weather permitting, you may have an opportunity to float on the Dead Sea. After that it’s back to your hotel in Tel Aviv. This morning you’ll leave Tel Aviv and drive to the Diaspora Museum for a visit, followed by a drive along the coastal plain to Caesarea, the capital of Judea under the Romans. Here you’ll see the excavations of the Crusader city and the Roman port, aqueduct and the amphitheater that has been restored to its former glory as a concert venue. Your journey continues via the Druze villages to Haifa where you will spend the night. Your tour of Haifa will begin at the summit of Mount Carme l where you will take in a breathtaking panoramic view of the Haifa Bay and Western Galilee . Next, you’ll continue on to the golden domed Bahai Shrine to visit the exotic Persian Gardens. After that you’ll head to Safed, the center of Jewish mysticism, where you will visit the ancient synagogues and the artists’ colony. You’ll continue to the Golan Heights to see the former Syrian bunkers, Kuneitra and the new Israeli town of Katzrin. Tonight you’ll spend the night in a Kibbutz. Today, you’ll start the day with a visit of Tiberias, followed by a drive to Capernaum to see the ruins of the synagogue and octagonal Church of St. Peter. Your next stop will be Nazareth where you will visit the Church of the Annunciation. Last on the itinerary for today is a drive via Beit Shean to Beit Alpha to see the remains of the mosaic floor of an ancient synagogue depicting the zodiac. After that it’s back to Tel Aviv for the night. After breakfast, your Christian Holyland Tour representative will assist you in your transfer to Ben Gurion Airport for your flight home.